Soap made with organic neem often contains moisturizing shea butter or coconut oil. A few neem oil drops can be added to shampoo before application. Extracts from organically grown neem trees are often used for medicinal purposes. Organic neem is an ingredient in a number of products made from different parts of organically grown neem trees, which are plants in the mahogany family that are native to Myanmar, Bangladesh, Sri Lanka, Malaysia, Pakistan, India and East Africa. The flowers, shoots and leaves are consumed like vegetables in some areas while all parts of the tree are used in traditional medicine practice. 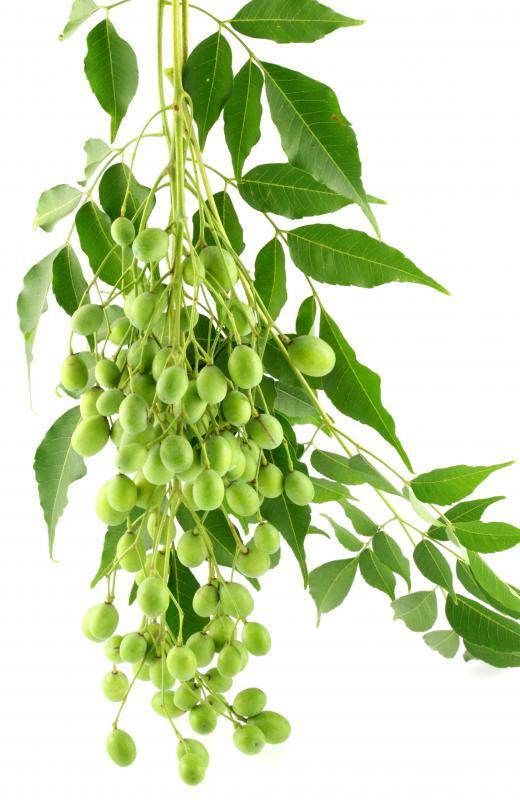 Organic neem oil is added to cosmetics, acne treatments and pet products. The tree is also an effective organic pest repellent and is used to control and eradicate more than 500 different insects. Neem trees grow quickly and often reach heights of between 50 and 65 feet (15 and 20 meters) tall. It produces long, dark green leaves and white fragrant flowers. The fruit of the neem tree is a drupe typically shaped like an olive with yellow or white fibrous pulp that encases a pair of brown seeds. One of the most common uses of organic neem is as a pest repellent. Neem is effective against many insects including mosquitoes, mites and ticks. Due to its low cost, neem repellents are popular in less affluent areas. Pest control products made with organic neem have been found to be non toxic to many beneficial insects and small animals. There are many products made with organic neem oil, leaves and bark. Lotions and gels infused with organic neem oil contain a high concentration of antioxidants that can shield the skin from harsh sunlight and other environmental damage. Dry and cracked skin and lips are treatable with neem oil creams, and it is an alternative acne treatment similar to tea tree oil. Soaps and hair care products are also available with organic neem. Organic neem oil soap typically includes other oils such as coconut, olive or jojoba, shea butter. It can be scented with lavender, patchouli or lemongrass. Shampoos and conditioners can help soothe an irritated scalp but are not considered to be as harsh as those with synthetic ingredients. Organic neem oil is even included in pet shampoos and anti-flea sprays and can be particularly effective for companion animals that suffer from skin irritations. All parts of the neem tree have a medicinal use. The bark and twigs help clean teeth and support good oral hygiene. Neem roots can be ingested to treat fever and leaf paste is applied to the skin of people suffering from measles, chicken pox or other skin irritations. Organic neem leaf is also sold in capsule form and taken as a supplement to improve skin and support the immune and digestive systems. What Are the Benefits of Neem for Skin? How Do I Use Tea Tree Oil for Fleas? How Do I Choose the Best Tick Shampoo? What are the Most Common Neem Side Effects?